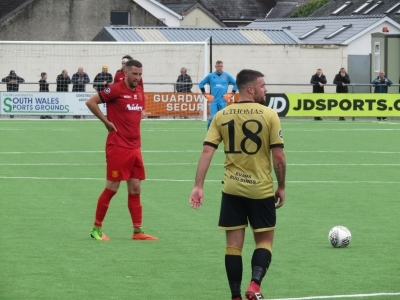 Newtown’s unbeaten start came to an abrupt end as Carmarthen took their chances to record a resounding victory at Richmond Park. The Robins knew a win could take them top, but after they passed up good chances in the first period the hosts took the game beyond their reach. Luke Bowen headed home in the first half, and doubled the lead in the second as he finished off a swift counter. And when Liam Thomas nodded home late on the game was done and dusted. Newtown had a few long range efforts late on but did little to trouble the stern Carmarthen backline. Chris Hughes was forced into a change, as Jake Cook, who had come in for the suspended Craig Williams in the last two games missed out through injury. He was replaced by Ethan Jones, with the striker re-instated to the front line as Joe Kenton reverted to right back. The Old Gold began the opening minutes brighter as Greg Walters volleyed wide, before his deflected effort sailed just over Dave Jones’ crossbar. The Robins then settled, and carved the home side open with Nick Rushton’s cross finding Jones, but the striker could only head over. On ten minutes centre back Ben Bailey was left inscenced as he believed he should have had a penalty. Steve Leslie floated in a free kick for the defender, who looked to have been pulled back by the defender, but despite the appeals nothing was given. Jones was looking lively up front, as he went in search of his first goal of the campaign. An on 13 minutes he went close, cutting in from the left before his low drive cannoned back of Lee Idzi’s post. The striker went close again on the 25 minute mark, latching onto a Kenton cross to turn a fire just over. After the Robins had their spell, the Old Gold began to creep back into the game and only a superb double stop denied them the lead on 30 minutes. Walter’s chip left the Robins backline standing and found Thomas, who skipped past a defender but Kieran Mills-Evans dived in front of the ball to head it clear. Then in the same move, a cross from the right found an unmarked Thomas, but Jones kept his header out from point blank rage. 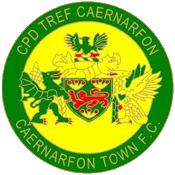 However Carmarthen kept the pressure up, and moments later a deep cross from the left found Bowen who nodded home to give his side the lead. The Robins settled again, and should have been level right on the stroke of half time. Callum Roberts’ cross bounced off a defender directly into the path of Neil Mitchell, but the striker ballooned his strike over the bar from eight yards. Alex Fletcher had a good chance blocked at the start of the second period, before the Robins were hit on the counter attack and fell two behind. 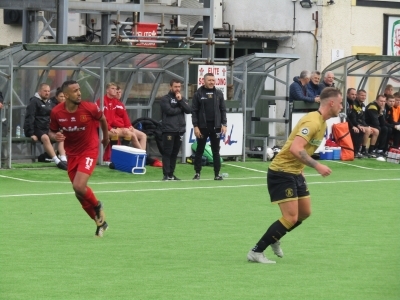 From a Robins set piece, Carmarthen won possession and Jordan Vickers ran the length of the pitch down the right flank, with Bowen waiting to smash home the cross for his second of the game. Thomas lashed over for the home side, before the Robins had a great chance to level. Nick Rushton found Roberts on the overlap and the defender cut inside, but the Old Gold defence scrambled back to stop the shot. 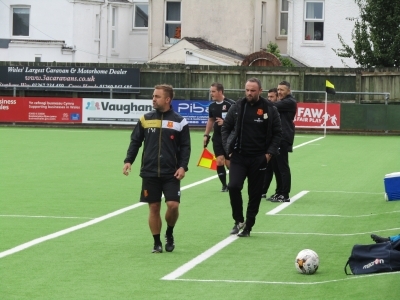 Leslie fired over as the Robins were becoming increasingly frustrated as they tried to get a foot hold back in the game. Hughes introduced Luke Boundford and Sam Phillips from the bench, but within minutes the game looked out of reach. A carbon copy of the opener saw Luke Cummings cross for Thomas to head home unmarked at the back post. 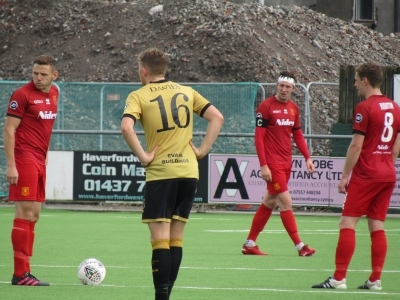 Carmarthen carved out two chances in the second period, and they put them away to take the game out of sight. In contrast, Newtown had been unable to take their chances when they were on top and couldn’t carve open a resolute Old Gold backline in the second period. Leslie went close with a couple of late free kicks, as Idzi kept out efforts from Phillips and Kenton. The Robins best chance of the second half came in stoppage time as Roberts pulled it back for Boundford, who skewed wide from five yards. 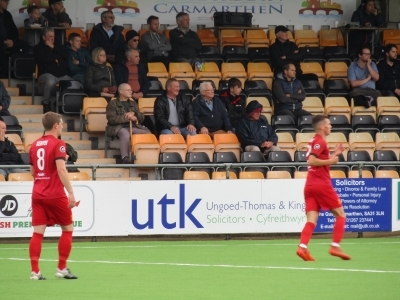 That summed up a frustrating afternoon for the Robins, who will need to pick themselves up ahead of a trip to Connahs Quay next week.